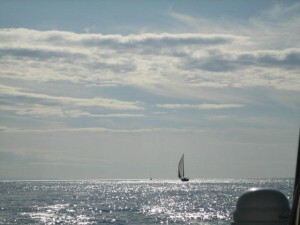 October started out sunny and cooler with the sea and air temperature dropping by about 5 degrees a week. 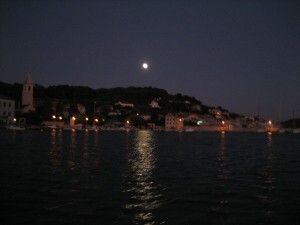 We first noticed the change in weather enroute back to Sukosan from Stari Grad on the island of Hvar, although we didn’t appreciate the significance of this “sighting” at the time. Yes, it's a refrigerator. . .an omen of things to come. Colder weather means a new wardrobe too. 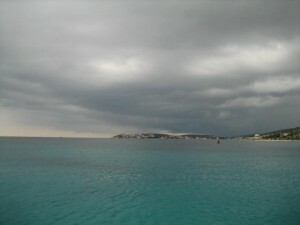 We overnighted in an anchorage on the mainland called Stari Trogir and watched a storm system pass north of us. Our friends in Sukosan had high winds and torrential rain, none of which reached us–just lucky this time. After the front the weather was calm for a few days–calm meaning no wind–but still pretty nice. 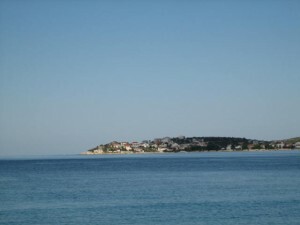 We have seen so much of Croatia that we are experiencing “island overload.” We have visited every major island, and many that most people have never heard of (like Otok Prvic near Sibenik) and still have time to kill before we haul the end of the month. We feel like gypsies at this point, just wandering around. After visiting with our Caribbean 1500 friends on Rava we decided to return to Losinj, one of our favorite islands about 60 NM north, making a couple stops along the way. 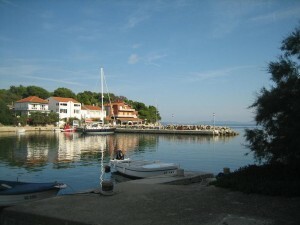 Our first stop was Bozava, a small harbor on the NE side of Otok Dugi. 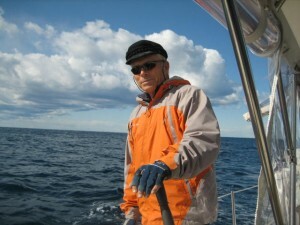 There was no wind and we motored the entire way, stopping earlier than planned in the hope that there would be wind the next day. Bozava is a bustling harbor in the season with many hotels and restaurants, but in October things are ghostly quiet. 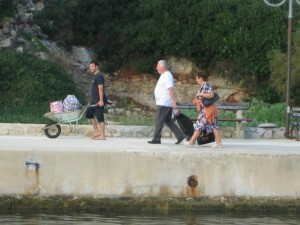 When the ferry arrives its passengers are locals, not tourists as is apparent from their luggage. 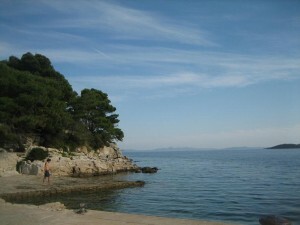 Bozava, like many Croatian towns has a public park along the sea and a well maintained walking trail. After spending the equivalent of $60 to moor stern to at the quay in Bozava (no bargains in off season mooring rates most places) we stopped at the island of Silba. 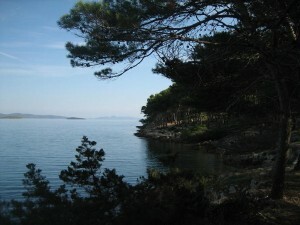 We had passed by this island before, but the large sheltered bay at Luka SV Ante looked very inviting and free—or so we thought. There were numerous moorings in the bay but Destiny was the only boat so we were particularly surprised when a small power boat showed up at dusk to collect a mooring fee—another 150 kuna—too late to move so we were stuck. 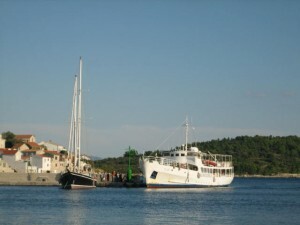 Croatia has many “designated anchorages” where you are charged a fee whether you use a mooring or your own anchor, but this late in the season and at such a remote location, we never expected to pay. 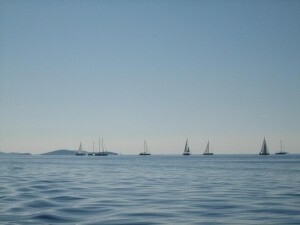 All in all, sailing in Croatia has proved to be much more expensive than we anticipated–more expensive than France or Italy. 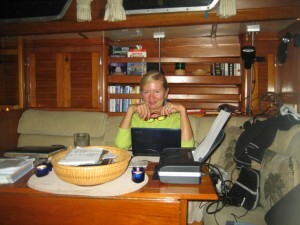 From Silba it was under 20 NM to the island of Losinj and the anchorage at Artaturi where we had stayed twice before—no charge to anchor, but with weather coming in we moved to the dock at Mali Losinj to ride out a the bora described in a previous post. Leaving the island of Losinj, we had about 60 NM to cover on the way back south to Sukosan and nearly three weeks before our haul date of October 29th–so more island hopping. Premuda is a small island to the west of Silba and after leaving Mali Losinj we headed there, not wanting to incur a fee at a designated anchorage. 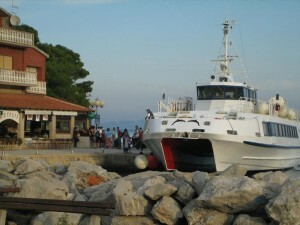 Premuda, like Silba, is a small island and while it has ferry service there is very little there. 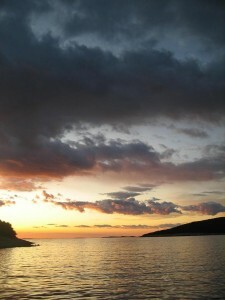 There was a small cove off a large bay on the west side of Premuda that provided good protection. While motoring most of the way we observed snow on the high peaks of mountains on the mainland—a real reminder that the weather was changing fast. 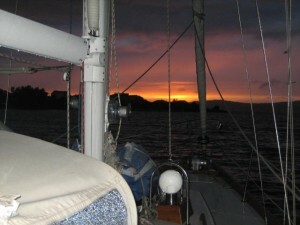 While anchored in Premuda a thunderstorm passed nearby about 2 a.m. but the night was otherwise uneventful and the morning dawned cool but partly sunny. The water temperature is now down in the low 70’s from a high of 86 degrees F just a week or so ago. After two more stops at Lucica on Otok Dugi and Muline on Otok Uglian (both repeats) we arrived in Suksosan on October 16th intending to ride out yet another forecast bora in the marina. Being in the marina proved to be more uncomfortable than being on anchor. The constant movement of the boat against the lines made it difficult to sleep and the wind, while moderate never reached the forecast velocity. So, back out to the harbor we went after two days. Fortunately, Sukosan has a large bay that is protected from all directions but west and is not a designated anchorage i.e. free. The weather forecasts are now for rain and wind—SE one day and NE the next. We are waterlogged and tired, and ready to get off the boat. Amazingly, even after a day of torrential rain we have a sunset. For the past two days we have been at anchor in Sukosan just outside the marina where we are scheduled to haul Destiny on October 26th a few days earlier than planned. The wind blew SE at 20-25 kts. 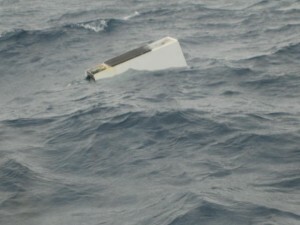 (with one gust recorded at 33 kts.) 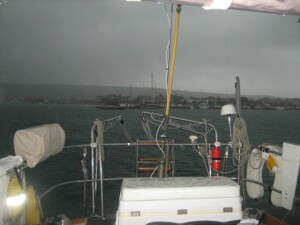 for one day then went NE and is blew 22-25 kts., then 27-29 kts.with gusts over 30. Anytime the wind has abated, it has poured rain. Destiny and its crew are getting pretty waterlogged at this point. We have heat in the cabin which makes it comfy, but the temperature difference and humidity create condensation that coats every exterior surface. We have water dripping everywhere, most of it coming from inside the boat. We estimate that we have overstayed our time in Croatia by about two weeks, during which the weather has gotten significantly worse. Our haul date has been moved up to Monday, October 26th and we will leave Croatia on October 28th by overnight ferry from Zadar to Ancona, Italy. After a few days of touring we will be on a plane back to Boston on November 2nd. 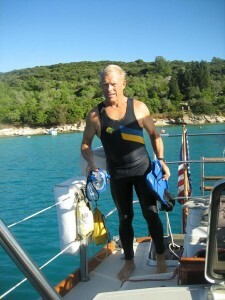 WINTER IN CROATIA: DESTINY ON THE HARD THE BORA–BRING IT ON!